Description: Amtrak - Coast Starlight waiting in the southh end of Gilroy,CA for track work to be completed. This photo at about 5pm. The Starlight normally passes through Gilroy at 10:30am each day. Description: Amtrak's COAST STARLIGHT stalled on the main-line at Sargents crossing- There is a UPAC freight stopped right behind the Amtrak-Track work at Chittenden Pass caused the delay-this Southbound Amtrak photo taken at 4pm in Gilroy,,way late again!!!! Description: The southbound Coast Starlight pulling away from the Albany station. Title: The Return of an old Friend.. 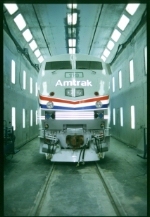 Description: I rode behind 118 in 2003 on my Coast Starlight Trip going Southbound. So that's why it's the return of an old friend. 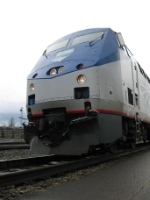 Description: Northbound Amtrak Coast Starlight stopped at Albany station. 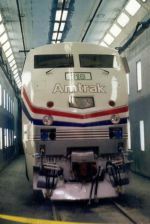 Description: Second engine on a northbound Amtrak Coast Starlight. Description: A southbound Coast Starlight headed south into the late afternoon sun. Description: South bound Starlight stopped at siding south of Woodburn in the flat part of the Willamette Valley. Description: A view of the Albany yard from a bridge. The left portion of the yard is PNWR's, the right is UP's. Description: Northbound Coast Starlight leaving Woodburn. Description: This one is for you Pat, No words are necessary. Description: Amtrak #14 Coast Starlight approaching Albany station at MP 690.7, Brooklyn Sub. Description: This was back when the starlight service was suspended because of mudslides up in Oregon. Description: A trio of P42s leads Northbound Coast Starlight train 14 through Albany on a rather cloudy day. Description: #8 Amtrak's Empire Builder on the BNSF at Maiden Rock on account of washouts in Wisconsin due to Spring flooding. Passengers between St Paul and Milwaukee are being taken by bus and this train will stop only for crew change on its way to Chicago. Description: Coast Starlight between Brooklyn and East Portland Junction. Can you see the old right-hand spur in the ballast? Description: Because of a half hour station stop at Portland Union Station, it's beyond easy to catch both Coast Starlights twice in the same day.